I’m shaking from hitting the curb as I pulled in. I don’t see any damage, but I’m uncontrollably jittery. It’s a good thing I brought my journal tonight. My mocha Frappuccino will just add caffeine to my jitters, but the journal, well, that’s relaxing. I hope. 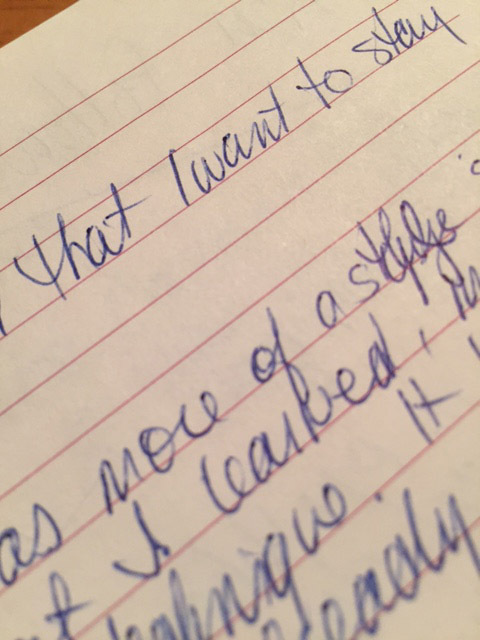 It’s an older journal, and I’m looking for something writing related. A passage caught my eye this morning, notes from my belly dancing article for U. S. 1. It draws my mind back to the interview. Movement draws my attention. The two chess guys have left my table, so I pop over, freeing myself from Mr. Wobbles here. I’m closer to the windows now. It’s suddenly dark outside, the dark of a storm approaching. Trees are stretching their branches in that helpless way, reaching to stop the storm, knowing they can’t. They’re victim to the tosses of storm winds. I continue reading my notes and transcription. I might as well because I can’t find what I’m looking for. “It confirmed a lot of things I’ve learned over the years,” Kim says. I spread out with room to spare and reread the U. S. 1 Philly nightlife article. I still adore the twists and turns of the language. I don’t like the attitude of the writer–she comes across as too know-it-all in-your-face–but the language is alive. “Rolling sushi with ‘frightening perfection'” is still my favorite. Her vibrant language makes you want to keep reading to discover what she’ll describe next, and how. This is how you write Show Don’t Tell: “J. Crew crowd and martini meat market.” Her typing tongue makes some of my Singles articles pale in language comparison. But it also inspires me to write outside the box, to stretch, to compare and to create. Back to my journal. What did Kim say next? How good was my article with the material I collected? My fiancé–oh, I just love the sound of that– just called to share warm fuzziness. He’s on his way up for the weekend, and he was thinking how he’ll only be doing this drive for a few more months–155 days, to be exact. Then I’ll be in Delaware. That made him think of the box and shopping bag of my stuff upstairs. I take a symbolic “something” every time I drive down to spend the weekend. He said he realized soon all my stuff will be in his house. Our house. We did a simultaneous awwwwww. Together. He’s an adorable man. We are going to have a great life together. 10:15pm. I’ll be kicked out soon. That’s okay—I’m done for the night. This has a nice sense of atmosphere. I liked it a lot. Hi, Diana. This piece had a poetic feel to it, especially the ending. I like it.